As promised, here's the brochure for GHCC's Middle School and High School Winter Camp. 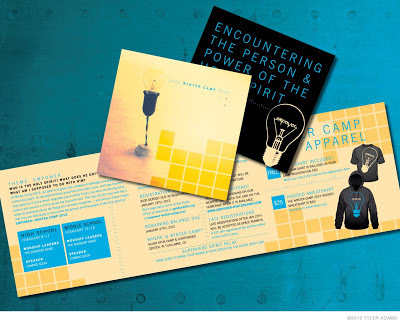 The theme is Empower, with the goal of helping the students encounter the person and power of the Holy Spirit. The main imagery is a lightbulb, which we are using as an analogy for the students to see how the Holy Spirit works in and through them, much like electricity does through a lightbulb. On its own a lightbulb is worthless, until it is empowered by electricity. Hope you like it! Visit empower-wintercamp.com for more info about the camp itself or to download a registration form if you are in Middle School or High School.